From past till present, Vietnamese people have transmitted a folk-song, which say “ If you want to eat white rice with catfish, wear the best conical hat, you should come to Chuong Village”. Actually, the image of the conical hat has appeared everywhere in a long time ago thanks to its 300 years in making the conical hat, and nowadays the village has been renowned with its iconic product “Non La”. Let’s come and see the way to make the beautiful hat. 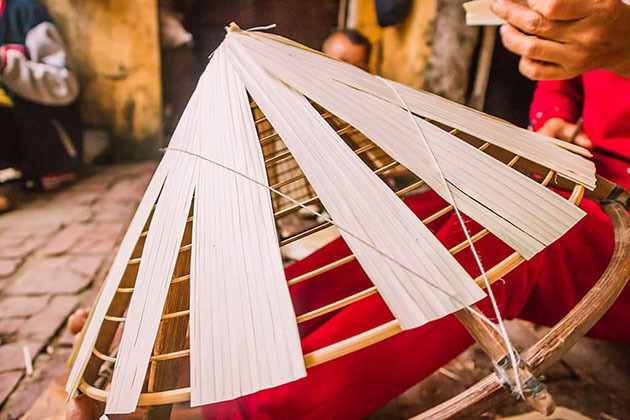 Chuong village is situated on the west of Hanoi Center, and it’s famous for its own iconic conical hat product or called “Non la” in the original. Non la gives a discreet charm to Vietnamese women from generations to generations, no matter rich or poor, in the big cities or rural areas. The charming image of traditional Vietnamese girls with Ao Dai and Non La impresses international visitors a singular characteristic of well-sought Vietnamese culture. Similar to Chuyen My Village & its pearl inlaying craft, Van Phuc Village with their high silks, Chuong hat village has its own delight for the iconic conical hat. Many generations in Chuong village work quietly to preserve and uphold the longstanding custom of the conical hat (Non La). Obviously, you can buy a conical hat made in other places, but just Non la in Chuong Village will always be the best. Conical hat in Chuong village is robust, stunning, that is why Vietnamese can distinct Non La in Chuong Village from many other conical hats made in other villages. 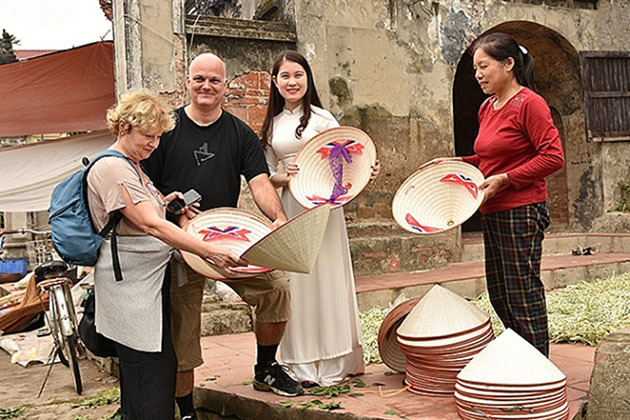 If in the past conical hat just used to shelter from the sun and rain, non la nowadays is like a special original souvenir that visitors can bring back from Vietnam. Just a half day in the village will complete your Hanoi Vietnam local tour! How to Make A Delicate Conical Hat? 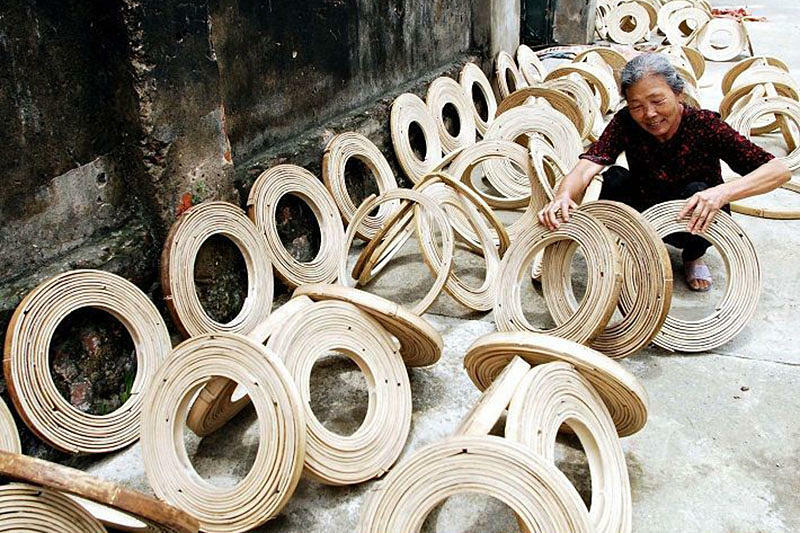 A good conical hat requires not only an intelligent hand but also the craftsmen’s experience. Patient and meticulous is indispensable for a conical hat in Chuong Village. Let us show you how to make the iconic conical hat! 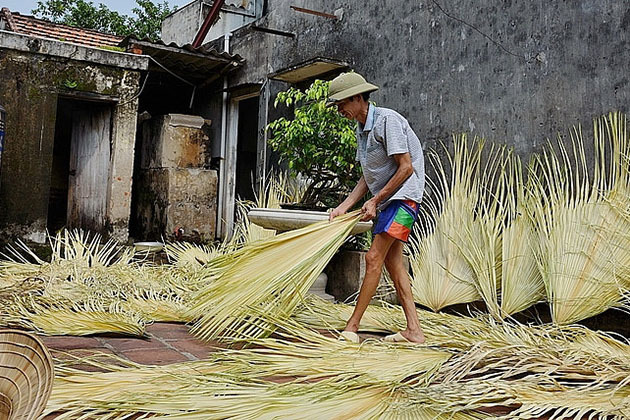 To make a hat, we have to gather materials from many areas across the country, and its materials consist of silk thread from Trieu Khuc village in Hanoi, palm leaves from Quang Binh province, and bamboo to make the hat frame taken from Hoa Binh and Thanh Hoa province. After gather materials, they start steps to steps. Firstly, bamboo has to be broken up into very skinny and strung throughout the dry season and after submerged in water to prevent the hat from tearing and breaking. The main rings of the body have to be smooth and shiny. Next, after being clear by sand, the green palm leaves need to be dried in the sun, iron with fire. Nowadays people sometimes use sulfur to make them white and protect their color. Continuously, we start to sew from the top to bottom, it takes a day for old craftswoman to sew a hat, while young people can do it for 3 hours. After the sewing process, the hat is piled to prevent termites, as the oil is dried, we have a completed conical hat. Thanks to the diversity of transportations, transferring among places is easier than ever. Just 40 km on the west of Hanoi center, it’s easy to get Chuong conical hat village. From Hanoi, you can take bus/ taxi/ or ride motorbike yourself from Hanoi to Chuong Village. + Most people in the village cannot speak as well as understanding English, so you can book a tour in Hanoi, included English-speaking tour guide and combined other destination around to delve into the experience at origin Hanoi Vietnam. + If you’re planning a trip to Chuong Conical Hat Village, you should go on the 4, 10, 14, 20, 24, and 30 of moon calendar every month. 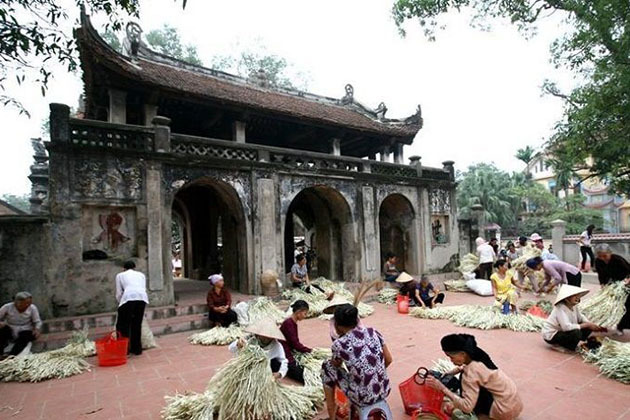 Refer our suggestion about a half day in Chuong Hat Village or design your own day tour itinerary with Hanoi Tailor-Made tour. This entry was posted in Hanoi Villages. Bookmark the permalink.